You only realize how reliant you are on internet communications when those communications fail you. I already wrote about how my first time skyping was postponed, because a provider was temporarily not working. Well at least, then I was warned beforehand. This time, however, I didn’t see it coming. I checked all the cables but nothing helped. All because I did not read the paperwork. My fault. Always read the paperwork before you start cursing the technology or the people behind it. The big plus is of course, that I suddenly had the time to do the things that I hadn’t gotten around to. Like doing the voice-overs for a Diftong documentary or preparing a tasty fish chowder. 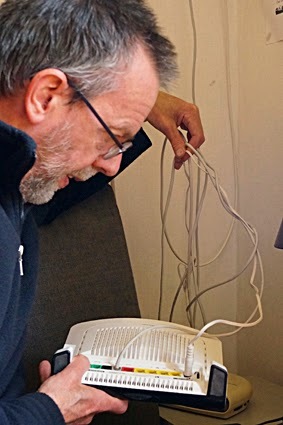 And today a man came with a modem, plugged it in and switched it on. Nothing to it. And it works, as obviously you can read this.